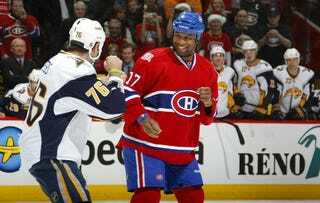 Hockey Goon Wants to "Change the World"
• Former Montreal Canadiens enforcer Georges Laraque says he "just want[s] to improve people's health and change the world." So, he was named a deputy leader of Canada's Green Party. • And finally, from the "Hickey's Biased Coverage Files," never one to be outdone by the Phillies' Brad Lidge blowing another victory to a walk-off home run, the Cubs' Sean Marshall serves up a cycle-clinching, game-ending home run. ... Also, Eagles' mute DeSean Jackson got hurt and Villanova's Scottie Reynolds is going to take his talents to Lazio, Italy. It's Sunday. It's Sunday. It's Sunday. Just a little nip in the 'ead don't mean nothing. Let's do this.